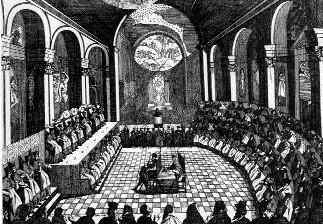 Council of Trent was the 19th Ecumenical council of the Roman Catholic Church. Important members of the Catholic Church met in Trento three times between December 13, 1545, and December 4, 1563, as a reaction to the Protestant Reformation. It stated current Catholic doctrines on salvation, the sacraments, and the Biblical canon, it answered all Protestant disputes. The council often could not meet when they wanted to, and sometimes could not meet at all, because of resistance from the popes and revolt against the emperor.Charles V, Holy Roman Emperor wanted the council to meet, and Pope Paul III summoned the council in 1537, but the plans fell through. In 1538, ideas for a council again failed. The pope asked for the council to meet in 1542, but it did not actually meet until 1545. The council was not active from 1547 and 1551. It again met from 1551 to 1552, when it was suspended due to a revolt against the emperor. Pope Paul IV (1555-1559) strongly disliked Protestant ideas and the council could not start again until his succesor took office. The council met for the last time from 1562 to 1563. The Council of Trent was part of the Counter-Reformation. It would be over 300 years until the next Ecumenical Council. Pope Paul III saw that the Protestant Reformation was getting bigger. Before, a small number of priests were part of the reformation, but soon many princes, particularly in Germany, supported its ideas. Therefore, Pope Paul III desired a council. But the council could not meet until 1545, and met right before Martin Luther's death. The council was moved to Bologna in March, 1547 with the excuse of avoiding a plague; without any plans to meet again, September 17th, 1549. The council was reopened at Trento, May 1, 1551, by Pope Julius III (1550–55); broken up 1552, recalled by Pope Pius IV (1559–65) for the last time, January 18, 1562, when it continued until December 4, 1563. To stop the ideas and practice of Protestantism and to support the Catholic Church's ideas. To change the parts of the church and actions of church leaders that damaged or hurt the Catholic Church's ideas and image. The church's interpretation of the Bible was final. Any Christian who did not agree with the interpretation was a heretic. Also, the Bible and Church Tradition had equal authority. The relationship of faith and works in salvation was defined, following disagreements over Martin Luther's doctrine of "justification by faith alone". Catholic practices such as pilgrimages, the veneration of saints and relics, and the veneration of the Virgin Mary were strongly reaffirmed. The selling and buying of false indulgences were banned. The doctrinal decisions of the council are divided into decrees (decreta), which contain the positive statement of the conciliar dogmas, and into short canons (canones), which condemn the differing Protestant views with the concluding "anathema sit" ("let him be anathema").